Collaboration can be a painful process, especially between authors of different disciplines. This book is an outgrowth of discussions between a Political Scientist and Economists at the School of Urban and Public Affairs, University of Louisville. The Economics perspective is found in Chapter 3 and was largely written by Frank Götzke. The Political Science oriented review, Chapters 2 and 6,aswellasall the case studies were largely provided by Steven Koven. Most of the book, but es- cially Chapters 4, 5, and 7 evolved as a consequence of conversations between the two authors. We believe the product of two disciplinary approaches has produced a collective outcome that is greater than the sum of individual parts would have been. In this book we have attempted to combine the analytical, empirical, historical, political, and economics approaches. 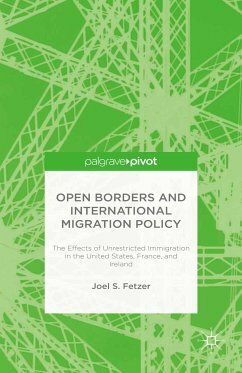 Chapter 3 presents an analytical model, based on economics, Chapters 4 and 5 summarize empirical census data related to im- grants, and Chapter 6 reviews the legislative and political history of immigration. Theoretical Perspectives: Economics, Culture, Politics.- The Political Economy of Immigration Policies and Politics.- Immigrant Contributions to American Economic Development.- Immigrant Contributions to American Culture.- Immigrant Contributions to American Politics and Immigration Policy.- Immigration Policies Outside of the United States.- Conclusions.